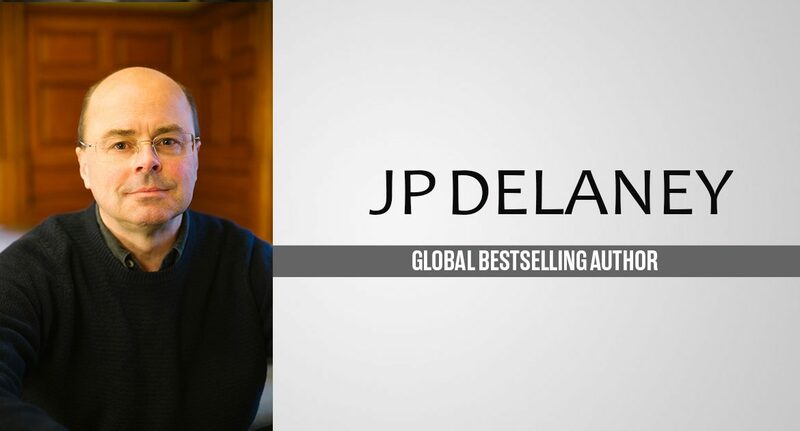 JP Delaney is a globally bestselling author who has written fiction under other names. 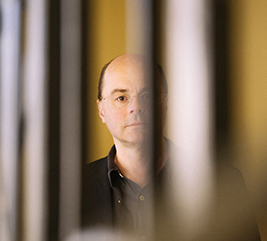 He was previously a creative director for the largest advertising agency in the UK. His first psychological thriller The Girl Before has been optioned for film by Imagine Entertainment. Claire Wright is a struggling actress working to honey-trap men and see if they’ll cheat on their wives. During one of these incidents, she meets Stella, but the following day Stella is found brutally murdered. The police are certain Stella’s husband, Patrick, is guilty of her murder and enlist Claire’s help to get his confession. The problem is, Claire isn’t sure Patrick is really guilty, and as she falls deeper under his spell, she realizes there’s more to this set-up than she’s being told. An altogether compulsive book that should be used as a descriptor for ‘psychological thriller’, Believe me is a fast-paced thriller that I read quickly, barely able to acknowledge time passing me by. Part of this is because the protagonist, Claire, is so well written and intriguing, and part of it is that the structure is very linear, with few flashbacks to break the pacing. For many years I wrote advertising campaigns. Of course, many writers have been through ad agencies – I worked alongside Meg Rossof, for example, in an agency where Salman Rushdie and Fay Weldon had once had adjoining offices. But unlike many writers, I found I rather enjoyed the whole process. Ads are all about clarity of message and holding your audience – useful skills for any writer to learn. JP Delaney is a pseudonym. What made you do this rather than publishing under your real name? How is writing in this genre different than your previous books? I’ve written books in several different genres, and publishers (and retailers) tend to believe its confusing for readers to pick up a book expecting one kind of story only to get something very different. Personally, I think it bothers readers very little…. But it’s easier just to go along with it and use a different name. The Girl Before was optioned for film. Any chance Believe Me will be as well? Has this changed things for you in any way? Do you still write the same, or is there more pressure now? Believe Me has indeed been optioned, by a major Hollywood production company. The big difference is that this time, I’m doing the initial adaptation to screenplay myself. As this is a book that grew out of my fascination with acting, screenplays and film-making generally, that felt right. As a male author, is it difficult writing female protagonists? Do you prefer writing one gender over the other? Personally I prefer writing female characters. I’ve no idea why. Maybe it’s because women are in a more interesting place, historically – that tension between what society tells them they should be doing and what their historical role has been. Hmm. Harry Thompson, This Thing of Darkness; Barbara Trapido, Brother of the more Famous Jack; Marcella Hazan, Principles of Italian Cooking. Let’s talk about Believe Me. Where did the idea came from and what inspired you to write it? It’s partly based on a true story, the murder of Rachel Nickell on Wimbledon Common in 1992, and the subsequent undercover operation to try to lure the main suspect, Colin Stagg, into a confession. The decoy in that operation was a policewoman, but I started to wonder: what if she’d been a professional actress? And what if she’d realized, even while she was doing her job, that the man she was being paid to entrap was actually innocent? I ended up moving my location to New York, and the story I eventually wrote has very little resemblance to the Nickell case. The idea changed and morphed as I developed it – but that’s where it started. Did you know what would happen at the end before you wrote it? Yes. The ending is a twist, but I personally hate those bolted-on twists that feel they weren’t even part of the original story. My ending – I hope – will feel to the reader both like a surprise and completely obvious and necessary… If I’ve done my job. Your descriptions of the settings are so evocative, and your characters gorgeously flawed and authentic. Claire in particular felt very acutely like an actress; even her thought processes and how they affected the plot. How do you research and where do you find inspiration to create such compelling characters? One of the things I loved most about my day job in advertising was that I got to record voiceovers and radio ads with some really great actors of both sexes. And usually – with radio – it was just me and them, sitting in a studio, trying stuff out. Watching a talented actor at work is an extraordinary experience – the way they can change meaning with a simple inflection or gesture. Since then I’ve always wanted to write about an actress from inside her head, so we’re alongside the process by which she shapes her own reality. It’s intriguing that you don’t tell your reader exactly how the characters have evolved, but leave it up to the reader to decide. Even Claire never really seems to know what’s the performance and what’s really her. Can you tell me about your reasons for this? There’s a great saying about acting that I use in the book: ‘Acting isn’t lying. Acting is behaving truthfully under imaginary circumstances.’ That’s the crux of my fascination with it, I think – to a novelist, the possibility of a narrator who may themselves not quite know where they end and their character begins is such rich territory. Who is your favourite character in Believe Me? My narrator, Claire, undoubtedly. And my favourite quote about her comes from the tough police psychologist who’s been asked by the lead detective to assess her suitability for an undercover operation. Within minutes she’s discovered that Claire has a history of mental instability, including a failed suicide attempt. What actor/actress would you cast to play Claire, Frank and Kathryn? I had an image in my head of Kathryn Latham, the police psychologist, as being a bit like Helen Mirren or Rebecca Front. But the others are a blank to me. That’s partly deliberate. I try not to ‘cast’ in my head in case it becomes one-dimensional for the reader. What sparked your interest in Baudelaire’s poetry and inspired you to use it in Believe Me? What do you think readers will love about Believe Me? Hopefully, the fact that I keep you guessing. Claire is just a great character to write because you never quite know her. In every scene, she’s acting when you don’t expect her to, and being truthful when you think she’s acting. I find her mesmerising – and fingers crossed readers will too. 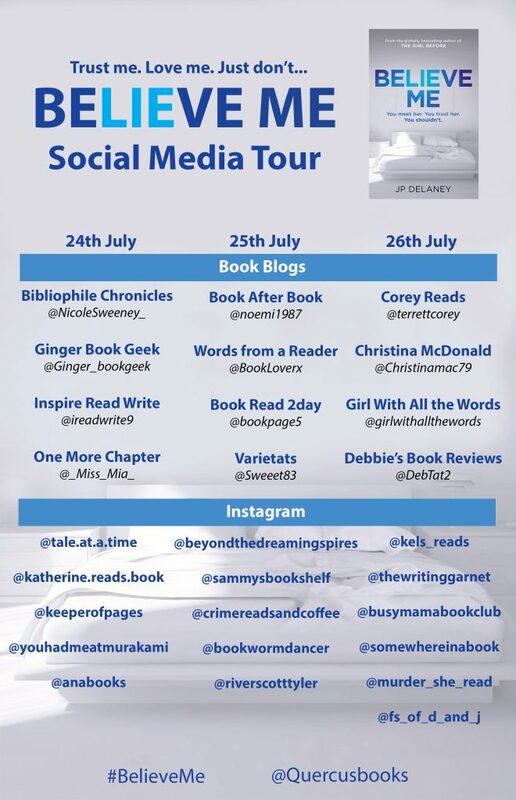 Thank you so much to Quercus Books and JP Delaney for letting me read Believe Me in exchange for my honest review. Visit all the stops on the book tour listed on the image.